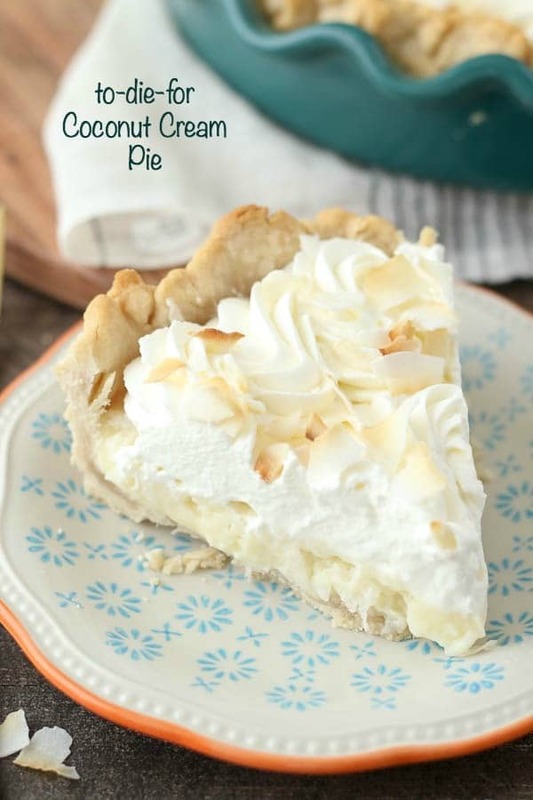 This to-die-for Coconut Cream Pie has a dreamy homemade, sweet coconut custard filling and it’s topped with plenty of whipped cream. It sits in a classic flaky pie crust. Prepare a 9-inch pie crust and blind bake according to the instructions. Be sure to poke hole the bottom of the crust with a fork and bake with pie weights or dry beans to prevent the crust from shrinking. Cool the crust completely. For the filling: In a small bowl gently whisk 2 egg yolks and set aside. In a medium-sized saucepan, combine the flour, granulated sugar, flour, heavy cream, sweetened condensed milk and coconut extract. Heat over medium-low heat. Start by continuously stirring to dissolve the dry ingredients into the wet ingredients until the filling is warm to the touch but not boiling. Take about ¼ cup of the pudding and whisk into the egg yolks to temper the egg yolks. Pour the egg yolks back into the pudding and whisk to combine. Continue stirring until the pudding starts to bubble lightly and thicken. Pour the pudding through a fine sieve into a medium-sized bowl. The pudding will be thick but you can use a whisk or spatula to help push it through the sieve. Optional: strain a second time through the sieve, washing in between. Prior to pouring the pudding into the pie crust, stir in 1 cup sweetened coconut. Then pour the filling into the baked pie crust. Cover the top of the pudding with saran wrap, gently pressing onto the surface of the pudding. Refrigerate 2-4 hours until it’s completely cold. For the topping: Prepare the whipped cream. Place a metal mixing bowl in the freezer for 5-10 minutes. Pour the heavy whipping cream into the chilled bowl and use an electric mixer to beat the heavy cream on medium-high speed until the cream thickens. Slowly add the corn starch and continue beating on high speed until stiff peaks form. Remove the saran wrap and spread the whipped cream over the pudding or use a large piping tip to decorate the pie. Garnish with toasted coconut. This pie must be refrigerated. 0 Response to "To die for coconut cream pie"
KETO CINNAMON ROLLS (SUGAR FREE, LOW CARB).